This is FRESH AIR. 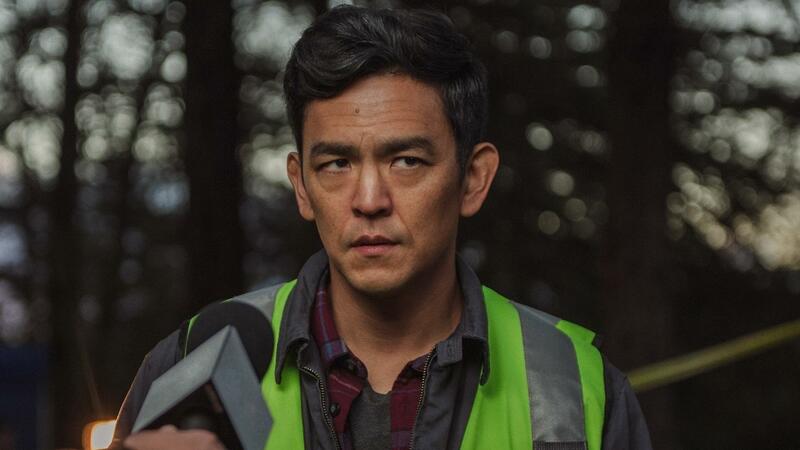 The new film "Searching," directed by the independent filmmaker Aneesh Chaganty, is a thriller that unfolds entirely through the perspective of a computer screen, starring John Cho as a man trying to locate his missing teenage daughter. The movie premiered earlier this year at the Sundance Film Festival, where it won both an audience award and a special prize for its innovative use of science and technology. Film critic Justin Chang has this review. JUSTIN CHANG, BYLINE: The ingeniously high-concept whodunit "Searching" isn't the first movie to turn the big screen into a computer screen to make you feel as if you're eavesdropping on online conversations and surfing the Internet alongside its characters. You might have seen the 2014 horror movie "Unfriended," where a group chat suddenly turns deadly - basically, the Skype version of Agatha Christie's "And Then There Were None." As a thriller, "Searching" is less violent, more compassionate and equally gripping. As a sustained technical exercise, it's remarkable. It takes the mundane details of your average computer session, from video chats to browser windows, and spins them into a taut, surprising, sometimes uncomfortably voyeuristic crime drama. This may be the first feature written and directed by Aneesh Chaganty, a 27-year-old Bay Area native and former Google employee, but the intricacy of his visual design is matched by a talent for old-fashioned suspense filmmaking. Anyone who can wring tension simply from the pulsing colors of a screen saver clearly knows what he's doing. Everything we see unfolds through the eyes of David Kim, a Silicon Valley widower played by John Cho. Because we're almost always looking at David's screen, we see his face only when it shows up on his webcam, like when he's FaceTiming with his 16-year-old daughter, Margot, played by Michelle La. The actors have a lovely rapport, and Cho's concerned-dad routine is at once funny, moving and completely dead on. When David sends Margot a text message playfully chiding her for not taking out the trash, he makes sure to include a photo of the overflowing garbage can. Margot replies that she'll empty it when she gets home that night, except that she never comes home, and David finds himself living every parent's worst nightmare. The only clues to Margot's whereabouts can be found on her laptop, and not long after reporting her missing to the police, David begins scouring his daughter's hard drive for clues. At the advice of Detective Rosemary Vick, played by Debra Messing, he starts calling Margot's Facebook contacts and asking when they last saw her. He pores over Margot's calendar and Venmo account and even raids her personal video diaries. As he watches them, he realizes, to his shame, that he didn't know his daughter as well as he thought, nor did he see how profoundly lonely a person she had become. Eventually, David has to confront the possibility that Margot ran away from home, though the fact that she called him three times the night of her disappearance would seem to contradict that theory. But much more will soon come to light, some of it involving Margot's online contacts and some of it involving David's younger brother, played by Joseph Lee. David goes after one of Margot's classmates who posts an offensive comment about her online, and Detective Vick orders him to take a step back. DEBRA MESSING: (As Detective Rosemary Vick) You can't assist in the investigation anymore. JOHN CHO: (As David Kim) What does that - what does that mean? MESSING: (As Detective Rosemary Vick) It means that we can't have someone this close to the case helping investigate it. CHO: (As David Kim) All I'm trying to do is to help you find my daughter. MESSING: (As Detective Rosemary Vick) You can't see things clearly. MESSING: (As Detective Rosemary Vick) We don't know that she didn't run away. CHO: (As David Kim) You're cutting me off? MESSING: (As Detective Rosemary Vick) You broke his jaw. CHANG: Most of the other computer-screen thrillers we've seen, like "Unfriended" and the Elijah Wood shocker "Open Windows," played out in real time with no cuts or breaks. Watching them could be exhausting, but they also left you feeling hard-wired into the user's experience. Because "Searching" unfolds over the course of a week, Chaganty and his co-writer Sev Ohanian have to compress David's investigation into bite-sized chunks. The result may breathe and flow a little better as storytelling, but without the real-time element, it's also a less tense, less immersive experience. At key moments, the movie cuts to online news footage of the ongoing police investigation, and the summary feels like a bit of a cop-out, a lazy way to maintain the movie's gimmick. The story's second half is packed with all manner of fiendishly clever surprises and red herrings, and I'm not sure if the twists are rendered more or less convincing by the movie's online-all-the-time interface. What does linger in the end, all too plausibly, is Chaganty's vision of an era in which every facet of life is increasingly mediated by technology, our relationships very much included. He leaves you with the possibility that in a world where everyone is connected, maybe no one is. GROSS: Justin Chang is a film critic for the LA Times. If you'd like to catch up on FRESH AIR interviews you missed, like this week's interview with Andre Holland, the co-star of "Moonlight," "Selma," "42" and "The Knick" who now stars in the series "Castle Rock," check out our podcast. You'll find lots of FRESH AIR interviews. FRESH AIR's executive producer is Danny Miller. Our senior producer today is Sam Briger. Our interviews and reviews are produced and edited by Amy Salit, Phyllis Myers, Roberta Shorrock, Lauren Krenzel, Heidi Saman, Therese Madden, Mooj Zadie, Thea Chaloner and Seth Kelley. I'm Terry Gross. (SOUNDBITE OF ANAT COHEN TENTET'S "HAPPY SONG") Transcript provided by NPR, Copyright NPR.